Having obtained a diploma in breeding and training, I have been working with dogs for several years. 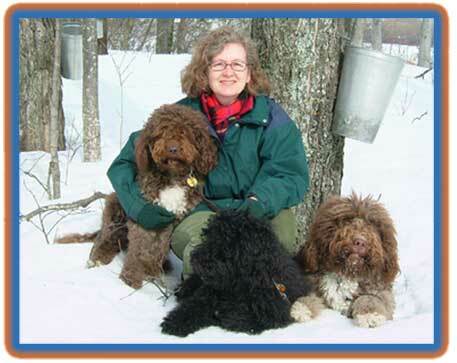 It is in 1998, however, that I met my first barbet. Its courage, faithfulness and good nature are the traits that won me over. The barbet is a rare and exceptional breed that must be protected. Owning one should be considered a privilege. Thougt it was not easy, I now own a family based kennel of that water dog originating from France. I use my knowledge and experience to raise friendly and well-rounded dogs while keeping their rustic looks. All my dogs, including the puppies, live in the house and are part of our day-to-day life. The puppies are socialized with animals and humans from early on. They are also introduced to various situations according to the canine developmental stages, as well as grooming. In addition, the transfer towards the adopting family's home is carefully prepared, with the gradual separation of the litter, amongst other things. You are invited to lean more about us by exploring this site.